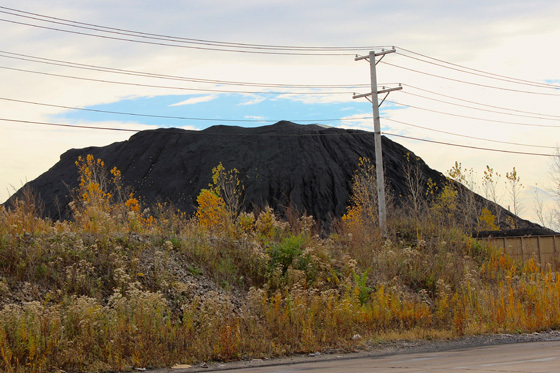 Residents in Chicago’s Southeast Side and South Deering neighborhood complain that black dust from petcoke piles along the Calumet River is polluting their communities. Traditionally, coal, crushed limestone and other materials have been stored along the river. But with the recent closure of two coal-fired plants and decreased demands for coal, petroleum coke, or “petcoke,” is now being piled up at these waste storage terminals. Petcoke [PDF] is the byproduct of refining heavy tar sands oil. BP’s oil refinery in nearby Whiting, Indiana, generates tons of petcoke. It is unable to store the bulk of the waste, so BP ships the petcoke along the Calumet River to stockpiles in southeast Chicago. From there, the petcoke is transported around the world and burned as industrial fuel. Michael Hawthorne, environment reporter at the Chicago Tribune, said that by the end of the year, BP is expected to finish work on new equipment that will more than triple the production of petcoke at its Whiting refinery. “The project will turn the sprawling Indiana plant into the world’s second-largest source of petroleum coke and Chicago into one of the biggest repositories of the high-sulfur, high-carbon waste,” Hawthorne reported. The largest stockpile storage terminal in southeast Chicago is owned by KCBX Terminals Co., a subsidiary of Koch Industries. 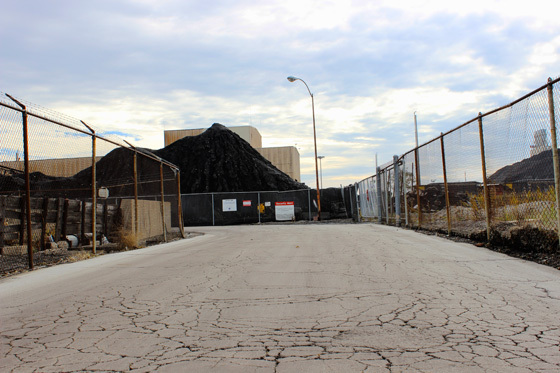 In Whiting, BP’s Clean Air Act permit and a federal settlement require petcoke piles to be enclosed by 40-foot walls. Illinois doesn’t mandate such precautions. The mountains of hazardous petcoke piled up at KCBX Terminal are unenclosed and free to blow in the wind. Hibbard says her kids can’t play outside on windy days because of the petcoke dust. “You can even feel the little speckles of dust hitting your face,” she said. Illinois law does require some dust-prevention measures including spraying the stockpiles with water, but environmentalists say this isn’t very effective. Enclosing the piles is the only way to contain the hazardous dust from blowing, they say. Environmental activists contest that claim, pointing to states like Indiana and California where petcoke stockpiles are required to be enclosed. The Environmental Protection Agency is currently investigating the neighborhood complaints against KCBX. On Monday, Attorney General Lisa Madigan filed suit against KCBX Terminals. Madigan said the petcoke piles have been growing with out adequate environmental safety precautions in place.